Do you have a Crawler and want to participate in the circuit? 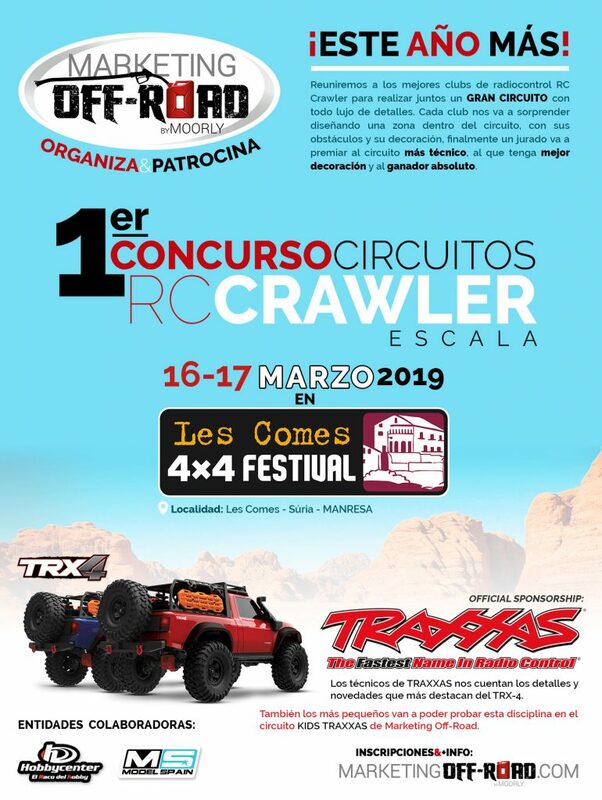 Marketing Off-road sponsors and organizes the activity of RC Crawler, exhibition of 1:10 radio-controlled off-road vehicles on the Les Comes estate, Súria (Manresa). We will bring together the best RC Crawler radio clubs to make a great circuit together in great detail. Each club will surprise us by designing an area within the circuit, with its obstacles and its decoration. Finally a jury will reward the most technical circuit, which has the best decoration and the absolute winner of the 1st RC Crawler Circuit Contest. Fans and the most curious, will be able to TRY and PARTICIPATE in the RC Crawler activity piloting the TRAXXAS TRX-4 the best selling car. Also the youngest ones will be able to try this discipline in the KIDS TRAXXAS circuit of Marketing Off-Road. During the day, do not miss the EXHIBITIONS of the experts with their wonderful SUVs to scale.